Forum 246 as seen from Odakyu-line. A fantastic structure is visible in the facade. Edo Tokyo Museum - Kiyonori Kikutake - 1993. The grand exhibition hall lifted from a giant podium on four giant legs which provides vertical access. The main access is through a disturbing red escalator. Another bubble project this time the city museum, which covers the history and development from Edo to Tokyo with a story ending somewhere around the Olympics gives a certain insight into the city. As many bubble projects the cost of this museum was big, and a better end result could surely have been delivered for the same amount of money. But there still is something charmingly utopian over this whole project. Sadly the podium, the vast outdoor space underneath the museum seems sadly under used. The would be a wonderful setting for a park project. The architect behind the museum Kikutake is mostly famous for Sky House, metabolism and his various marine city schemes. Sadly the 1994 Tokyo Sofitel, close to Ueno, telling the this story is no longer. He also worked with the group behind various hyper building schemes. Another example of typology. Here a slim and high house next to two wider houses. Random placement of smaller windows. 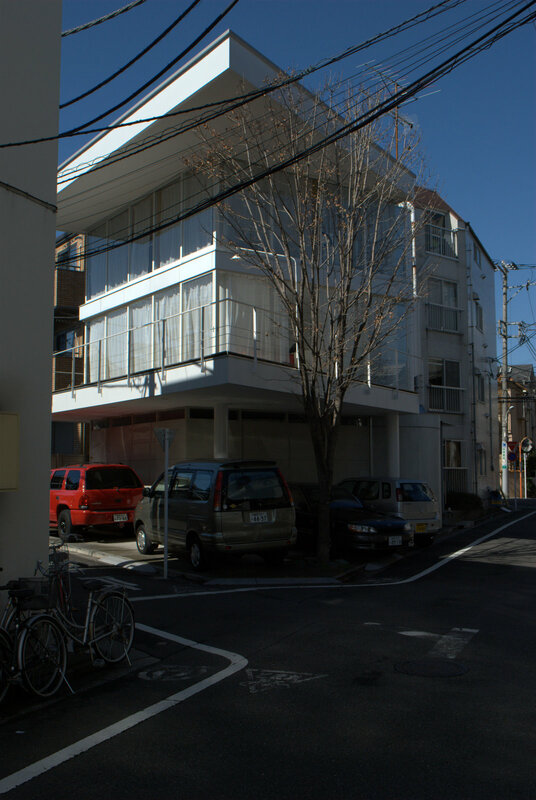 The plot behind the house belong to a small danchi like building with a large garden. Air condition units around the house. One for every space or in this case floor. Note the cable connecting the 3rd floor with the outdoor unit on the second floor. From a typological view this is an typical Tokyo house, however the colour sets it apart. Everything else is within the borders of normality; roof shape, window placement, plants along the wall, shop combined with house, signage, vending machine on corner and size. Miyasaka Community Hall, Masamitsu Nozawa Building Workshop, 1990. Gable shapes lifted by truss. The plaza in front of an office development in a block in Akihabara. The office tower owns a large but not complete part of the block. Some older, small scale houses sit along the edge of the block. The intersection between properties surely must mean something. Note that the steps in the gap between the house. One house has complete concrete filling, the other offers a softer surface with steps on top of gravel. Look below for a series of gardens in a dense pocket of streets on the border of Setagaya-ku and Shibuya-ku. This series of pictures started as an idea that (almost) every utopian megastructure could be found represented in a street garden, I abandoned the project, not because it is false but because is trivially true. For one better example street garden see Yet Another Street Garden. This type of almost identical buildings arise on larger (for small values of large) plot developed into a series of independent houses. 4 different uses of the space provided.